The author of this blog is having fun. How? Why living in a truck, of course! I am historically addicted to living on the road. I started off traveling by land in a Ford Bronco in 1968. With a tent. With a winch on front, new fuel filter, and cooking gear in the back, a box of tools, a box of kitchen equipment and some clothes. A husband and two French hitchhikers. To Bolivia. And back. 1 year’s worth of excitement and discovery. Next came an old pickup with an aluminum topper, living in Mexico and Costa Rica for several years. The most comfortable. The safest feeling. It was a horrible body with a brand new engine and low, low 4wd. I called her “The Big Blue Fart”. We went through jungles and cities with the greatest of ease. Then came fancy and with a class-too-small rv called “Chela”. Chela and I toured the USA for two years. Blown brakes, leaky this and leaky that, never a comfortable ambiance. She always stood out. She was grossly under powered. Grossly under pinned (shocks, wheels, bearings). But she kept me dry and warm. And I learned much about travel in the USA. Next was a VW bus to canoe swamps and rice fields and Okefenokee and the Everglades. Was fine ’til the engine caught on fire. I loved the ability to carry the canoe. Never had a great deal of trust in this vehicle. Never even had a name. Then the dually, which turned into a great 4wd camper, adding only a few pvc poles and some tarps. Her name was Boedacia. I knew and loved this truck. She had a willing heart and fierce elegance… and an easy engine to work on. Lots of room under the hood. 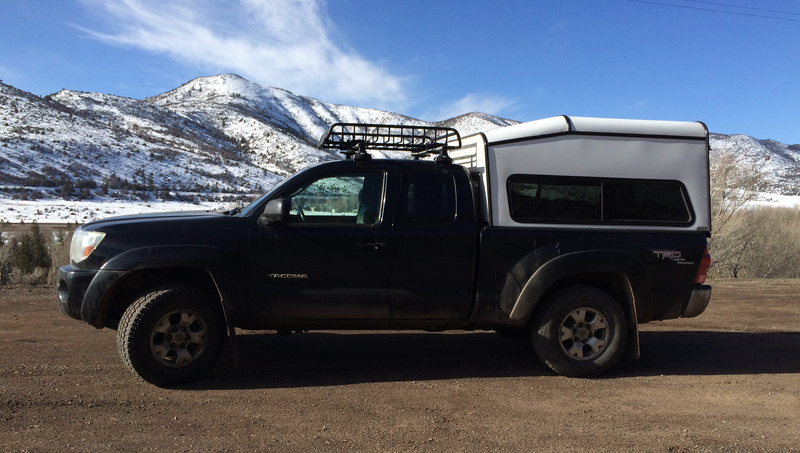 Now truck camping is with “Lilith”, a 2006 Toyota Tacoma. Pickett- Howdy! The Bronco and VW bus were mighty cool. Current truck looks like the best. Thanks so much for the package. My mom and sister are out at the beach on long island with us this weekend. Eleanor is going to keep the necklace. She doesn’t really wear jewelry much but wrapping it like a bracelet was a hit. She is going to eventually give it to Eleanor Keith Huffines (a rising sophmore at Episcopal High School). Eleanor likes the picture too and will take it back to Alaska. Hope that your trip is going well and that we get to see you soon. Call me sometime if the mood strikes! Thanks Robbie! I wore it as a bracelet, too. Having fun in Colorado, eventually headed to NM and AZ. Maybe. You never know what cool place will pop up on the road. YO Yo Picket ~peace to you from Alpine TEXAS! This is Casey from ThreeRiversBLM. Please keep in touch and let Carmen and I know what new cool stuff you are discovering. You have friends here in FarWestTexas and we hope you make it over here next season; SO So much to show you around here. Plus, we’ll be back in TheLandofEnchantment a few times before it gets cold… don’t hesitate to let us know if you need anything ~we’ll surely help if we can. Keep LivinLarge and sharing that Big Smile ! Great to meet you and Carmen. Am looking forward to Big Bend, and will surely let you know when I am in the area. Great meeting you both.